Curry and Ginger Marinade: Combine curry powder, ginger, garlic, lime peel and juice, olive oil and soy sauce. Pour marinade over shrimp; let stand 15 to 30 minutes. Toss shrimp in marinade once or twice. Cucumber Dip: Toast walnuts in 250°F oven until crisp, about 15 minutes. Cool and chop. Peel cucumber if desired and cut away seeds; chop finely. Combine chopped cucumber, yogurt, sour cream, lemon juice, dill and seasonings. Set aside. Add toasted walnuts before serving. To Cook: Remove shrimp from marinade and thread onto skewers with red pepper chunks and lemon or lime slices. 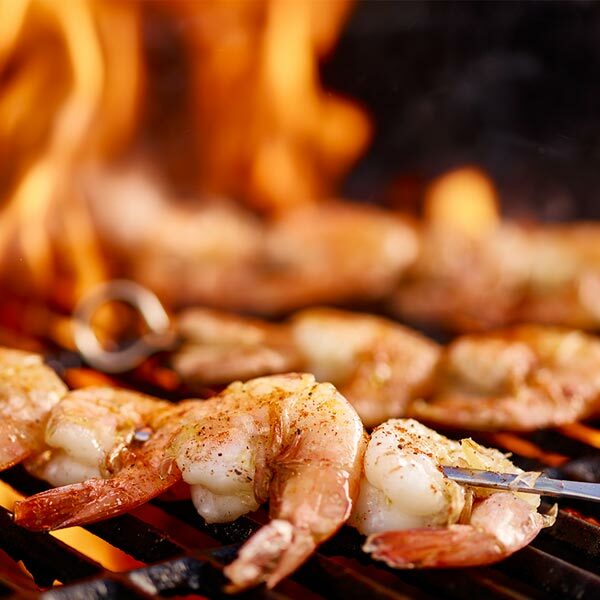 Grill or broil until shrimp are opaque. (See cooking time below) Brush with marinade while cooking. Serve with couscous and cucumber dip.